Shimano compatibility charts come in handy for assembling your bicycle, planning purchases, or troubleshooting. We have included their compatibility charts from 2017 here. The biggest changes of the 2017 model year are the improved flagship Dura-Ace 9100 groupset, and the variety of disc brakes and compatible brake levers. The source of these charts is the Shimano global web site. chart color code: Blue items = new for this year. Brown items = no longer in production. For 2017, Shimano has released several disc-brake related products, and an all-time greatest Dura Ace groupset (the 9100 series). Next some Shimano products available from our affiliated shop: Amazon (speedy delivery, good selection). The below links take you there. Plates: Cover Plates for Shift Levers. Triple Crank and compatibility: See the 2011 front drivetrain compatibility chart above for some details. The left (front) shifter, the crankset, and both derailers may be specific for a triple gearing. If you have a 105 front brifter, you may be lucky as it's non-indexed so the same brifter can be used with a double or a triple. If yours is Ultegra, there should be a difference so you need the specific front brifter for double or triple whether you're on the 6600 or 6700 series. The front derailer has much different spacing on a triple crankset. And the rear derailer has a long cage to collect more chain - so both of these are specific for triple gearing. Another thing that many people don't realize - the new Shimano chains are *not* triple-compatible. (As indicated on the 2011 compatibility chart), The reason for this is that the new chains (CN-7901, 6701, or 5701) do not allow enough lateral movement. So for the moment, your triple chain needs should be satisfied by KMC, by SRAM, Wippermann maybe, or by the older Shimano chains (CN-7801, CN-6600, CN-5600). Brake Shoes and Pads R55C3 is the model number for the Shimano branded spare brake pads (2011). It comes in different compounds for alloy (aluminum) and carbon rims. The pad length is 55mm and this pad is compatible with BR-7900, BR-7800, BR-7700, BR-6700, BR-6600, BR-6500, BR-5700, BR-5600, BR-5501, BR-5500, BR-R650, BR-R600, BR-R561 calipers. R55C3 replaces the R55C model which used the same specification but slightly different compounds. Kool Stop has for many years marketed fully compatible replacement pads in a few different compounds. Swiss Stop markets high-performance pads which are also compatible. There are also a few other vendors. Rear derailer capacity limits For Details, see derailer capacity table. Shimano charts provide for an exception to the compatibility rules between cassette sprockets and rear derailers. Specifically, only the 7900-, 6700-, and 5700- series rear derailers have sufficient capacity to support a cassette with sprockets differing as much as 16 teeth or more from small to large cog. For this reason, the 11-28 tooth cogset (17 tooth difference), available in 7900-, 6700-, and 5700- series is not compatible with the older series rear derailers. The 11-27 tooth cogset has the same limitation. For the older 10-speed derailers (7800-, 6600-, and 5600-series), the maximum cogset tooth size difference supported is up to 15 teeth (as in the 12-27 size). In the 2012 and 2013 model years, the available products and their limits have seen some additions and special cases. These details are being tracked in the derailer capacity table. You can also Shop Now at our store. Part Naming Color Codes Shimano parts such as FC-6601 may have a 1-letter suffix, for example FC-6601-G. This letter is a color indicator and for the purposes of compatibility, this letter is ignored. The monkey can sleep easier without it, knowing the color does not affect compatibility in any part combination. Use the charts and the monkey without the color suffix. Other suffixes were for example, RD-5600-S (silver), ST-5600-L (black), where the FC-6601-G is gray. Parts with no suffix are silver, as is the suffix S, only used when there is another color option for the same part. Derailer: For best results always replace the cables when upgrading any drivetrain part. In 2010, Shimano introduced colored cable housing options whereas previously only "Dura Ace Gray" was available. The SP41 PTFE cableset is standard replacement derailer cable and housings for the Shimano 7900 Dura-Ace system. Compatible with all 7- through 10-speed Shimano road shifter/derailer sets as well as SRAM. Shimano's 7900 shift cable/housing set is ideal for the Dura-Ace 7900, Ultegra 6700, and 105 5700 STI levers with cable routing under the bar tape. In fact, it was because of the under-the-bar-tape cable positioning change first designed for Dura Ace 7900 that the PTFE-lubricated housing was introduced. PTFE (better known as DuPont Teflon) coated cables do a good job of minimizing friction and greatly enhance shifting performance. The engineers at Shimano have spent countless hours researching and developing shift cables and housing that will optimize the performance of their shifters and derailleurs. The PTFE(Teflon) coated derailer cable set is the most advanced they have ever produced. A complete set of cable and housing for Shimano derailers (enough for one road bicycle) features 4mm SIS-SP41 housing; Choose your color; Weight: 160 grams (reported); Cable Diameter: 1.2 mm; Cable Lengths: 2 x 2000 mm; Stainless steel cable for long life in all conditions. (Tip: Use the "gray" Dura Ace pack to get all end caps and ferrules to complete the job - the blue pack has been reported to contain fewer of these). Brakes: The 7900 Dura-Ace brake cable set has been optimized for Shimano levers but makes a great upgrade for most road systems. New super low friction PTFE coated cables virtually eliminate excess friction for top performance. The brake cable end fits road bike levers only. A complete set of cable and housing for Shimano brakes (enough for one road bicycle) features 1400mm x 5mm housing x 1; 800mm x 5mm housing x 1; 2050mm x 1.6mm cable x 1; 1000mm x 1.6mm cable x 1; PTFE coated stainless steel cable for long life in all conditions; two cable crimps, and two ferrules. 178 grams (reported). The Shimano Flight Deck SC-6502 Computer head features the following: gearing and wheel size data for four bikes can be programmed and accessed from one computer head. Program one, two, or three chainrings; display shows the number of chainrings programmed. Gear size display: once shift is made, computer will momentarily show what chainring/gear combination bike is in, 53-12 etc. One button on each brake lever controls computer function. Bracket and sensor kit sold separately. Compatible with compact road gearing. Compatibility: The Flight Deck SC-6502 computer will work with STI levers ST-7800, ST-7900, ST-6600, ST-6603, ST-6700, ST-6703, and ST-5600. It is not compatible with brifters ST-5700 or ST-5703. Use the wireless harness for all of the 10-speed brifters and the SC-6502. (10-speed Harness is ID SM-SC70) The wireless harness isn't completely wireless though. There are still wires that run from the STI levers to the computer (underneath the handlebar tape). But there is no wire running down the fork to the pickup. The older SC-6501 Flight Deck will work with most 9-speed Shimano brifters. 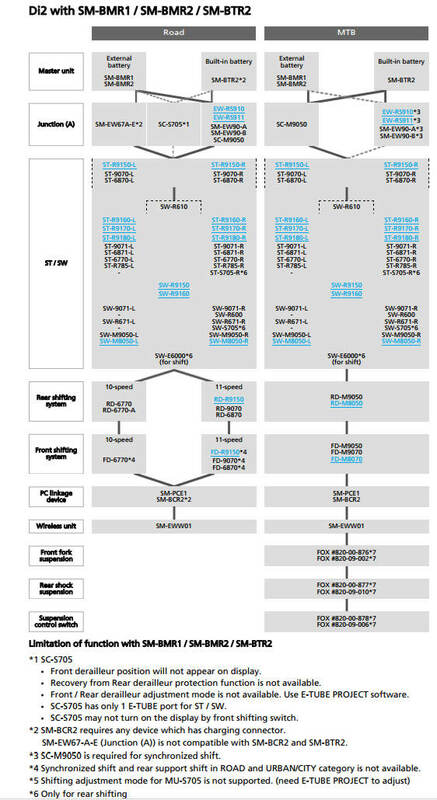 (ST-7700, ST-6510, ST-5500) Source: Shimano Tech Docs. Rear Derailer Naming and Charts The Shimano charts leave off mention of triple rear derailers, but there are important distinctions to be aware of. For the monkey and these note pages, we use the standard "03" naming convention for triple rear derailers. There are actual several possible naming conventions for rear derailers, and it is important to distinguish them. The triple-compatible rear derailers, designated on this site as RD-6603 and other IDs ending in "03", have a longer cage to be able to take up more chain, as triples run longer chains than doubles. In other places, these triple rear derailers are designated "GS" as in "RD-6600-GS". These are the same thing. One other description you will hear is "long cage" or "medium cage" to refer to road triples. On a road bike, it's considered long since it's longer than a short-cage RD used for doubles. But since there exist even longer cages (on MTBs for example), the road triple RDs are also called "medium cage" sometimes. Double Derailers: These are designated here as ending in "00" or "01". Other places use "RD-6600-SS" and other IDs suffixed with "SS", or possibly "RD-6600" short cage. There is little difference in functionality among RDs, so the Monkey learned to assume compatibility with respect to triple RDs as parallel to double RDs. Tip: for triple rear derailers, look for "GS" or "long cage" (sometimes aka "medium cage") or the "03" or "04" numbers. For double rear derailers, look for "SS" or "short cage" or the "00" or "01" numbers.